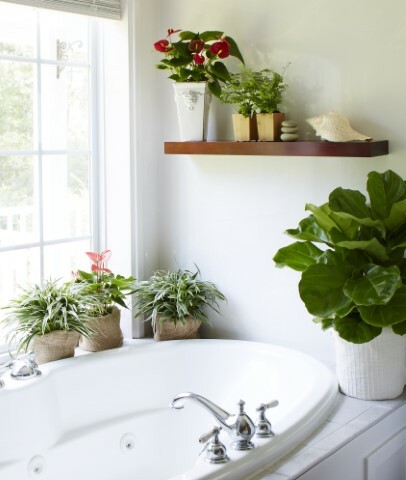 Your bathroom may not be the first place you think of to put a new indoor plant, but there are lots of great reasons to. 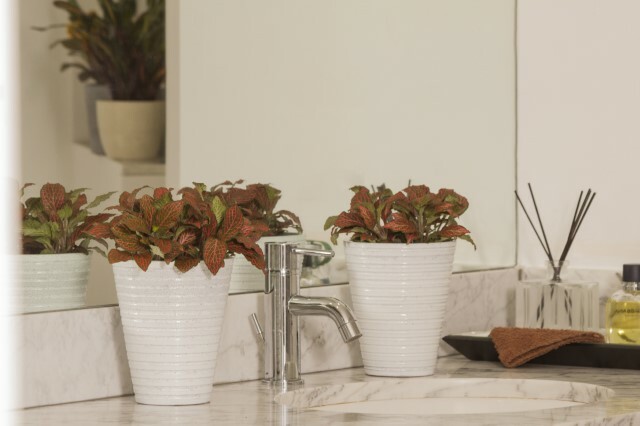 Did you know that plants can help clean your bathroom for you? Scientific research has shown that plants can effectively filter volatile organic compounds (VOCs) from the air, leaving it purer and fresher. Along with these VOCs, plants also have the ability to pull mold spores and other matter from the air, so while having a plant or two in the bathroom doesn't mean you don't have to scrub, it may mean you have to scrub a little less. Best of all, bathrooms can be one of the best places to grow indoor plants because of the extra humidity these rooms offer. 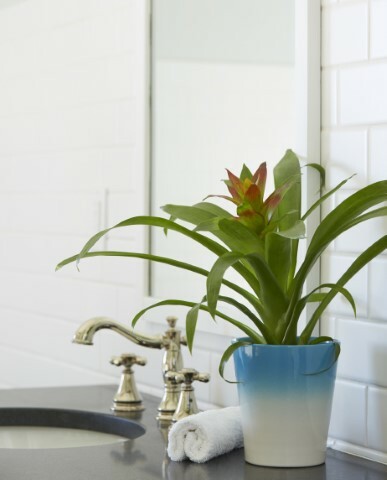 Most common indoor plants come from tropical climates where there's abundant moisture in the air, so each time you turn on the shower, your plants luxuriate. Bromeliads are tropical beauties (related to pineapples) that show off rich green foliage and flamboyant flower spikes in tropical shades of red, orange, yellow, pink, and white. They love warm, humid spaces, making one a topnotch choice for your powder room. A rock star of the indoor plant world, Colorful Aglaonema is an efficient air purifier and tolerates a wide range of lighting conditions, from low to bright. It's also delightfully forgiving of missed waterings, so you don't have to stress out about whether it'll wilt right away if it starts to get dry. Plus, Colorful Aglaonema comes in a wide range of variegated leaf patterns and has a range of colors. Don't want potting soil in your bathroom? 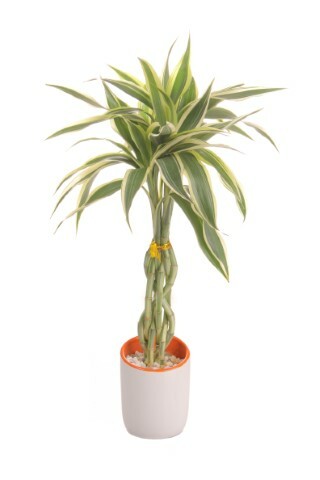 Lucky bamboo may be the plant for you! It grows great in low or high light (in fact, artificial light is just fine) and you can grow it in a vase of water and marbles and rocks. Care is a breeze -- just make sure the container doesn't dry out. 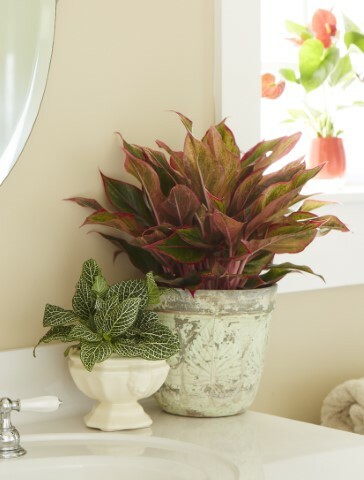 Like Colorful Aglaonema, nerve plant adds a splash of color to bathrooms. This tidy indoor plant doesn't take up a lot of space, so it's perfect for windowsills and countertops. Most varieties have rich green leaves veined in shades of red, pink, and white; some almost have a metallic look. They tolerate low light, but also do well in medium and bright spots. They love high humidity, too. Tried-and-true spider plant is as popular today as it was your grandmother's generation because it's so easy to care for. Like Colorful Aglaonema, you don't need to worry about growing conditions. It loves high light, thrives in medium light, and doesn't mind low light, either. It does best when watered when the top inch or so of the potting mix dries, but its thick roots store water, helping it power through times when it gets too dry.